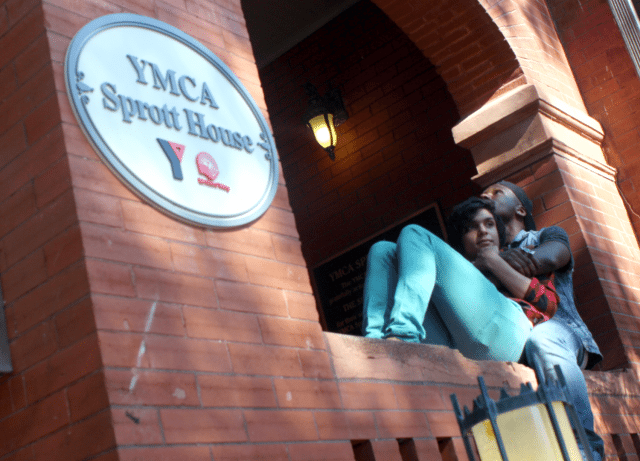 After six months in operation, the YMCA's Sprott House has become a safe haven for LGBTQ youth. Sprott House residents Akia Munga, left, and Gabriel DeSouza. Photo by Al Donato. When YMCA Sprott House opened its doors in February, Akia Munga could not have needed housing more. Munga, 24, had just been discharged from a shelter when staff caught him using meth in bed, merely days after he was on life support following an overdose on Seroquel—a medication used to treat various mental health struggles. 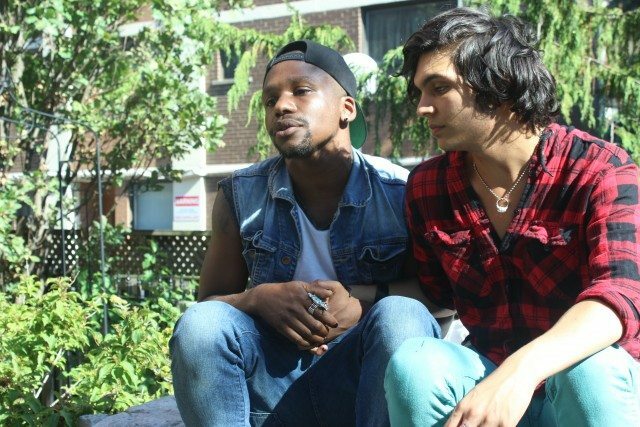 Munga and 24 other LGBTQ youth living at Sprott House are staying in a red-bricked sanctuary that emerged from the limitations of the 58 other shelters in Toronto. The city’s shelter system doesn’t work for many queer and trans youth. Sprott House’s staff, many of whom are also queer and trans, aim to sever those strings. In a document obtained by Torontoist, the YMCA insists that staff at Sprott House must encourage support when residents need it and independence when they don’t. Each of the 25 residents at Sprott House has a private bedroom and bathroom. A case worker and a counsellor are assigned to each resident for the year they stay along with a unique program to help them meet their personal goals, such as holding down a job or finding stability. They are expected to attend house meetings and complete chores. Instead of penalties for failing to meet those requirements, they’re incentivized by a monthly $25 gift card to Metro, Loblaws, or Shoppers Drug Mart. Youth share a kitchen stocked with groceries they buy or nab from the nearby food bank. They dine with prominent LGBTQ locals and allies at monthly Sunday suppers. In July, for instance, urban development writer Jay Pitter dropped by and helped youth fix up a traditional Jamaican dinner. A sense of community is also achieved through queer- and trans-friendly excursions around Toronto. Just a few months into operation, Sprott House residents have already met Laverne Cox at Sherbourne Health Centre, ventured to the Toronto International Film Festival to see Tangerine, and watched Mean Girls at a Pride Toronto screening. Many youth hang out together, which has bonded them and provided them with a sense of safety. 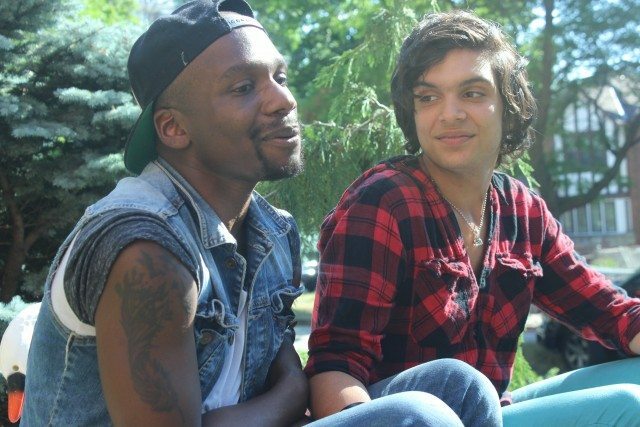 Whether dealing with non-consensual contact at Pride or overhearing someone being misgendered at the food bank, Munga and his partner Gabriel DeSouza, who is also a Sprott House resident, say youth are quick to stand up for each other in spite of their differences. 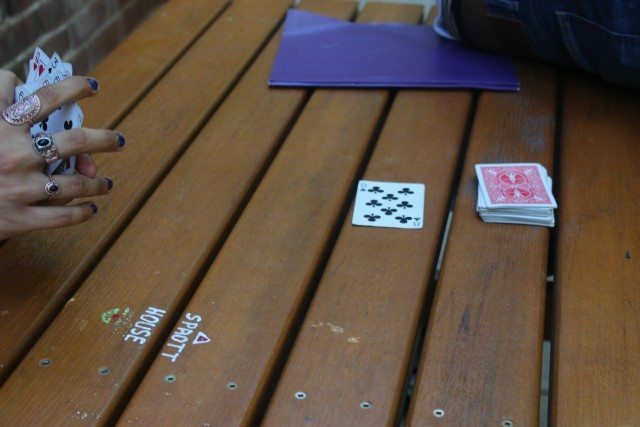 Residents shoot hoops together in the backyard, but Munga and DeSouza prefer playing cards on a picnic table by the stoop. The three-storey building houses a library of donated LGBTQ texts and a recreation room, which was recently upgraded with a flat-screen TV and a Nintendo 64. They’ve been playing a lot of the original Super Smash Bros. and Mario Kart. Unlike other shelters, breaking a house rule doesn’t result in eviction. YMCA Sprott House director Kate Miller says that there’s no strike system in place either. Munga says he has been gaybashed and robbed “so many times I can’t count.” It makes the safety of Sprott House so astonishing for him. Harrowing barriers that affect LGBTQ and homeless populations mean youth face multiplied disadvantages and dangers. How they navigate the shelter system is complicated by the ways staff and fellow shelter residents can hurt them or misunderstand their behaviour. Visibly out youth like Munga, who has been told he needs to “hide his swish,” can be treated unfairly based on their appearances. Outright harassment, sexual assault, and physical assault are fears shared by many queer and trans youth in transitional housing, driving them away from shelters and onto the streets. These risks were expounded on by Centre for Addiction and Mental Health (CAMH) researcher Alex Abramovich, who collected stories from LGTQ homeless youth on their experiences—some of whom were beaten by staff. His advocacy work contributed to city council’s decision to set aside $1.2 million from the 2015 budget for 54 beds that LGBTQ youth could take refuge in. But those beds aren’t enough to meet the overwhelming need for youth housing. A Covenant House study found that 2,000 Toronto youth experience homelessness every night. Of those youth using shelters, a street assessment by the City of Toronto revealed that one out of five identified as LGBTQ. Given that some may not self-report—estimates from the assessment are as high as 40 per cent—far more queer and trans youth are in need of housing. One youth in need of housing is Pigeon Kidd, a 17-year-old who identifies as asexual. When asked how she spends her days, Kidd says she “flails in circles, trying to find food and water.” Her nights are spent hanging out in 24-hour McDonald’s restaurants or scaling a school and sleeping on the roof. Kidd says her mother neglected her in December without any resources except a $100 Loblaws gift card. Since leaving home, she’s slept on friends’ couches, in trap houses raided by police, and on streets before ending up at Covenant House—Canada’s largest youth shelter. Covenant House reported to substance use program Pieces to Pathways that at least 25 per cent of the youth sleeping in its 94 beds identified as LGBTQ. In spite of the notable number of queer and trans residents, Kidd claims her needs were ignored by the shelter. Before they have nowhere to go, youth face myriad factors that lead them to seek temporary housing. Traumatic family breakdown is the leading cause for youth to leave home, reports the Canadian Homelessness Research Network. Abramovich’s research showed that gender and/or sexual identity plays a large role in conflict between LGBTQ youth and their family members. DeSouza knows this all too well. DeSouza, 18, was forced to come out when his brother leaked photos of him and his then boyfriend to his family. His mom gave him an ultimatum: he could change, or he could leave. So he left. With only a couple of shirts and two pairs of pants, DeSouza was in and out of the shelter system multiple times. He felt like shelters never prioritized his identity as a South Asian queer Muslim: DeSouza would starve or subsist on bowls of rice because kitchens would only serve pork or non-halal options. Now, both Munga and DeSouza are thriving in Sprott House, what they call a safe haven. Munga says his life has completely changed since February. He was a close friend of safer injection site advocate, artist, and former shelter-involved youth Brooklyn McNeil, who died earlier this year. Her influence, along with Sprott House’s support after he was evicted from a shelter in February, helped him find his place as an activist. He currently works as a harm reduction worker at Eva’s Satellite with DeSouza. He also volunteers with Black Coalition for AIDS Prevention, as well as at various health centres and shelters. Entering the stability and community at Sprott House, DeSouza thought, “I can finally breathe.” He recently graduated from high school and will be attending George Brown College for community outreach in the fall. DeSouza commends Sprott House’s staff, both LGBTQ and allies, for being culturally competent in the ways intersecting identities contribute to how youth can feel safe differently. Kidd, who hadn’t heard of Sprott House before being interviewed, said she would be interested in accessing it. She agrees that cultural competence with LGBTQ issues allows Sprott House staff to recognize other ways LGBTQ youth are marginalized because of addiction and mental health. “The staff there might know more, be more in tune to that,” she adds. However, Kidd would likely be unable to access Sprott House in 2016. It’s currently at full capacity, and the wait list is already capped at 10 applicants. Since it’s not expected for youth to move out, those waiting for a spot to open up within the year are told not to get their hopes up. Egale plans to open an LGBTQ shelter in 2017, differentiated from Sprott House by its focus on intensive counselling and services only for LGBTQ youth (Sprott House welcomes allies). The forthcoming shelter will have 25 beds for transitional housing, five set aside for emergency housing. However, LGBTQ housing doesn’t make the dangers of being queer and trans in Toronto go away. A month ago, Munga was assaulted by a group of men. One of them was angry that Munga had called him out for supporting the Orlando mass shooter. Although violence is a constant, Sprott House is one less place that actively puts them in harm’s way. Kidd: “They need to read up on mental health and stuff…it’s a terrifying experience to be trapped in a place because you’re too scared to leave. That’s already such a terrible experience. CORRECTION: A previous version of this story incorrectly stated that Jay Pitter is a member of the LGBTQ community. Torontoist regrets the error.